The Les Arcs/ Peisey-Vallandry Bikepark: setting the standard in the world of mountain biking VTT! 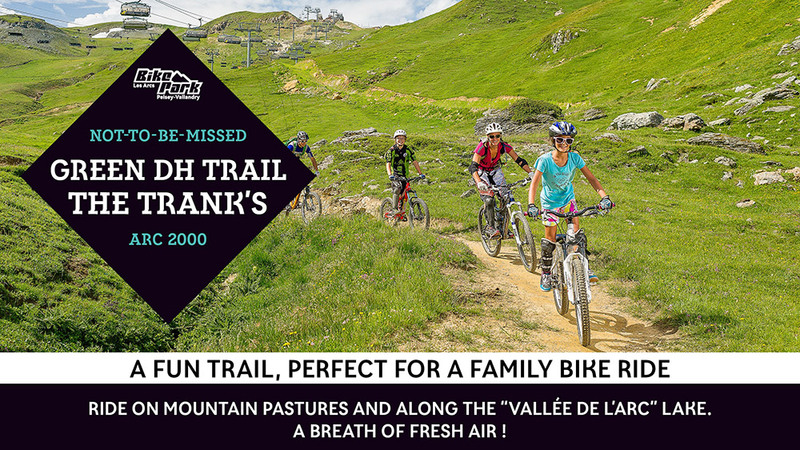 A fun zone approved by the FFCT (Fédération Française de Cyclotourisme – French cycle tourism federation), the Les Arcs/ Peisey-Vallandry Bikepark is an immense and varied playground. In partnership with the Commencal Commencal brand, Les Arcs offers a multitude of possibilities and caters for all sort of sport: DH (downhill), Endurance and Cross-Country. From Bourg St Maurice to Arc 2000, in the forest or in the open country, you will find more than 180kms of marked trails, from green to black runs, catering for all levels. La route 66 is an endurance but more advised for a family ride or E-bike due to its length and its characteristics..
Arc 1600 : consisting of overhead bridges in the forest, ideal for intermediate and expert riders. Initiation area with training modules for maneuverability.